Do you think slavery has an effect on the U.S. and the people here today? Is so, what is the effect? If not, why do you think it doesn’t have an effect today? Does slavery effect us today? I THINK IT DO NOT HAVE AN EFFECT NO MORE ON THE USA BECAUSE SLAVERY ENDED ALONG TIME AGO AND THERE’S NO MORE THAT I KNOW ABOUT. No. Beacuse it was long time ago……. I think it does have an effect on us today because people back then was nice and kind now all they wanna do is fight and kill each other i think slaver made them this way. Yes i do think that slavery did affect the US because many people are not here today because they were killed. I also think it did affect it because many people couldn’t complete there gaols. Yes because many people are not herer today because they were killed. yes i do think they still have an effect on us. WELL 2 BE HONEST IDK….PROBABLY IT DEOS OR IT DEOSNT…. I think it does have an effect today because here in the US sometimes people still discriminate on other people that might of think that they had there ancestors as slaves. well i’m not sure!…mayb slavery is effect on the u.s ppl. I think that slavery does have an effect in the United States because there is still raceism. I think that slavaery has an effect with the people today because we still use the “N” towards each other. I think the slaveri worke hard and the U.S scrimin the other people. I think that slavery does not have effect on da U.S and the people here today.I think that it doesnt have no effect because people are are getting along from different races. yes becasue is a sad and corls for a differ. I THINK THAT IN SOME PARTS OF THE U.S IT HAVE AN EFFECT BECAUSE PEOPLE ARE STILL RACIST. THEY STILL THINK JUST BECAUSE THEY’RE SKIN COLOR IS DIFFERENT THAT MEANS THAT THEY HAVE TO BE TREATED DIFFERENTLY. A little bit because people still have a little bit of racism in them today. I think that slavery still has an effect on the U.S today. Because there are some people that still discriminate on other people. And they may feel better than other people and may feel superoir than others.I think that slavery is still going even though it may be different. I believe that it kind of did cause an effect. I am not trying to be stereotypical, but nowadays African-Americans and Mexicans get mad sometimes for no reason. I think slavery caused this. i think yes because some white people was on youtube talkin about obam and callin him all type of names….. YES IT DOES, EVERY SINCE SLAVERY, THERE’S BEEN DISCRIMINATION. THERE HAS BEEN PROBLEMS WIT PEOPLE BASED ON COLOR, AND WEALTH. FOR EXAMPLE BLACKS AND WHITES STILL DON’T GET ALOE LIKE THEY SHOULD, BUT THERE’S ALSO BLACKS VS. HISPANICS, BLACKS VS. BLACKS, AND HISPANICS VS. WHITES. EVERYTHING THAT OCCUR TODAY IS BECAUSE IF THE PAST. I THINK IT DID BECAUSE EVEN THOUGH SLAVERY ENDED THE PEOPLE STILL WERE NOT FREE…IT KEPT ON GOING THEY DID NOT HAVE THE SAME RITES AS THE WHITE PEOPLE…IT ACTUALLY AFFECTED THE REST OF THE GENERATION OF THE ANCESTOR SLAVES..BECAUSE THEY USED TO SAY THEIR ANECDOTES ABOUT WHEN THEY WERE SLAVES AND THEY DID NOT LIKE IT BECAUSE IT REALLY LEFT A PERMANENT MARK ON THEIR LIFE! Yes I think it has a big effect on the U.S because that was a big part of the U.S history. It wasn’t good history but it was history. I think slavery do have an affect on the united states,because we study about history of slaves and how they were treated .It also have an affect on us because we still remember. it effects us beacuse that is messed up beacuse that is the people religon is dying of so that is why it effects the united states. because we still call ”N” towards each other. I think The Only Real Effect It Has On The People Of The U.S Today Is People Holding A Grudge Against It. That Began Thousands Of Yars Ago.. Yes it did have an effect on the US. Many Africans were brought to the US as slaves. They were put to work almost every where in the US,not many got to see it but the ones that did were in a more worse situation. Yes I do think and believe that the slavery has an effect on the U.S. and the people here today. I believe the effect today is how people specifically us the “N” word. I think so because people now a days of all race use this word. They all believe that this word is okay to be used in any kind of manner. I believe that all U.S. people were to stop using this certain word, things and problems wont be started as regular as they are. Also I believe that if people stop using this word there wont be a lot of fighting. But about the slavery thing, I believe that racism til this day still exist, because some what you call white folks, still use the “N” word and has hateriage towards a lot of African Americans. 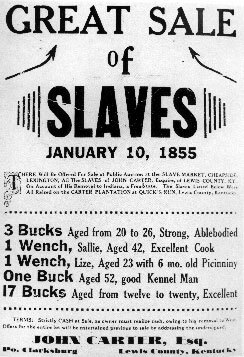 I DON’T THINK SLAVERY IS STILL AROUND WE GET TO DO ALOT OF THINGS ON OUR OWN WITHOUT HAVING PEOPLE TRYING TO SELL US AND WERE AROUND ALOT OF DIFFERENT RACES EVERYDAY.SO NO SLAVERY IS DONE AND I DON’T THINK ITS COMING BACK. YES BECAUSE SLAVERy STiLL DOES EFFECT US TODAy CAUSE SOME WHiTE STiLL WANT SLAVERy AND BECAUSE SOME PEOPLE ARE SCARED OF WHiTE PEOPLE AND SOME PEOPLE HATE THEM BECAUSE THEy STiLL WANT SLAVERy. I THINK THAT IN SOME AND THAT AIN’T RIGHT FOR ANYONE TO BE TREATED LIKE SLAVES OR ANYTHING LIKE THAT BECAUSE FOR NO MATTER WHAT WE ARE GOING TO BE TOGETHER AS ONE. ALL OVER THE PEOPLE ARE DIFFERENT BY MANY WAY AND THAT WILL CONTINUE FOR THE REST OF OUR LIVES AND WE SHOULD BE PROUD OF WHO WE ARE!!!!!!!!!!!!!!! I think it does because ttaht is what influced many racist peopel to discriminat others because of their past .Slavery lead other people to think they could treat people realy bad wich is not true every one should be treated equal because under gods eyes for him everyone is equal .So peole might think that because of what their ancestors went to they have the right to treat them with disrespect wich is not true. yeah i think it does because we havw learned not to discrimanate against anyone.anlos that we know that slavery is wrong an it should NEVER EVER HAPPIN AGAIN….. I BELIEVE THAT SLAVERY DOES HAVE AN EFFECT ON PEOPLE TILL THIS DAY. THEY ARE STILL DISCRIMINATING. I9 THINK THAT SLAVERY ISTILL HAS AND EFFECT ON THE U.S AND THE PEOPLE BECAUSE PEPLE ARE ISTILL BEING TREATED BAD. i think that bieng rascist s not cool cuz many people want slavery still and its not right cuz our society has changed!!! I THINK SLAVERY EFFECT THE U.S BECAUSE SOME WHITES STILL WANT SLAVERY. well….to be honest well i d k about that im not even sure about it so wT CAN I SAY IT DOES OR IT DOES’NT….. I THINK IT DOES HAVE A EFFECT BECAUSE SOME PEOPLE DONT GET ALONG VERY WELL BECAUSE OF THERE COLOR…. I think it had an effect and U.S. and the people here today cause it’s change evrything. There is no more slavery. But there is one thing that hasn’t change: people are still no being treated equal. well i think no because that was a long time ago …..
no,bescause all people get along. kinda because people look at the blacks lke yall supose to be slaves and other type of stuff and at the same time it makes black feel good by that we been threw alot and that a couple of the blacks was apart of the freedom so at the same time it wasnt for slavery and the strong blacks we have in the history probably will would still have it till this day. i think that it effect beause people don’t like to be call like that. I think it does have an effect today because some colored people don’t get along very well with some whites and mexicans. I don’t think it has an effect. but we still study slavery and there is still discrimination around here . I don’t it effects us know because everything change. well i think no because today people act as if they were free. Yes i think slavery affects us because if slavery never happened the world would be alot better. i think that the effect is that many slaves are like us right now, probably them had dreams and just wanted to live thier life normal. But its sad the way they die. they had to be truchered. I think there still an effect because there are still people who are races and still say the N word. I THINK THAT IT EFFECTS SOME PEOPLE BECAUSE IT ENDED A LONG TIME AGO, BUT WHITES STILL WANT SLAVES. AND THERE IS STILL SOME SEGREGATION, AND RACISM IN MANY PLACES. I THINK SLAVERY DOES HAVE AN EFFECT ON THE WORLD BECAUSE,THERE IS TO MANY PEOPLE DEAD BECAUSE OF SLAVERY.I THINK THAT SINCE PEOPLE KNOW SO MUCH ABOUT SLAVERY NOW THE DISLIKE CERTAIN PEOPLE.SO,SLAVERY DOES HAVE AN EFFECT ON THE WORLD. Well yes the effect is still in the U.S becouse the ”N” word is still used now in days and theirs alot rasism but in a differant way. No because that was just the past.What happens, happens.I know that it was hard for people to get over it, and it was also hard for their ansestors,but we can’t change anything. i think it effected the us because theirs still some people that descriminate others . yes because is not fair to have only blacks as slave. Yes,people heard about long ago and they are sad. I think it has had an effect because now people try not to discriminate. I THINK IT STILL EXIST IN SOME WAY BECAUSE SOME RICH PEOPLE HAVE MADES THAT DO THINGS THAT THEY DONT WANT TO DO. I DNT THINK THIS AFECTS SOME HOW THE US BECAUSE WAT I NO IS DAT THE SLAVERY ENED A “(LONG LONG’ LONG ‘LONG ‘LONG ‘LONG’ LONG ‘LONG’ LONG’ LONG’ LONG ‘LONG ‘TIME AGO)” WELL THATS WAT I NO..
yes i think its a big effect in the U.S because thier is still racism and in other parts of the world thier is still slavery…. I don’t know.Some people are over it because it was along time ago.Some are not because they did alot of bad things to them or there famlies. I do think that it effects today becuase their are alot of discrimination today in the U.S.. Peolpe dislike other people beuase of their race becuase where they come from. no because white people cant take over because theres all this gang voilence not even the police couldnt take over thats why i say no. i think it dont because slaveryisnt happening no more and thats all in the past but ther are still some people that are racist. i think that it do affect today because there is still problems with mexicans & blacks. thers fights and shootings. I dont think it has any effect on people any more because that was a long tima ago,but it might have effect on some people because they might see that when other people are raises it might remind them of what happend years ago but it has effect on some people but not on all of them! I think it does have an effect. The reason for that is because,the effect it has is it makes people racist and they dont like each other. i think that slavery is just wrong…and we shouldn’t have that ever again!!!! i think slavery does have an effect on the U.S today becouse of slavery the us became a very rich country. it is also effected the race of people living today in the us, there wouldnt be any black people. there probly wouldnt be any racism in this country beccouse there would probly be only white people!!! i vAlUe mY sIsTEr tHe MoSt [&] mY FavEz” . . . i vAlUe HEr BEcAuSe ShgEz My evErYthInG !!! !